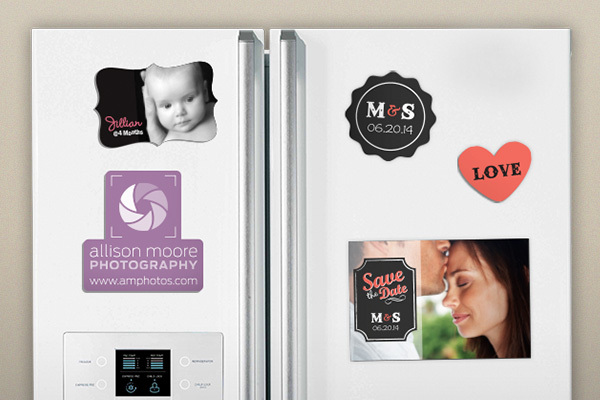 StickerYou’s latest product for helping you Make It Stick….MAGNETS! That’s right, StickerYou is adding magnets to their line of sticky, customizable products. The magnets are super thin and lightweight, can be die-cut to any shape at any size, and printed with any colours! Just like our stickers, there is no minimum order size. StickerYou magnets have a strong attraction, so they will adhere fast to any metal surface mess free, this includes vehicles, fridges, safes, microwaves, and more. How long have your magnets been stuck to your fridge? Years, likely! Custom magnets are a great way to keep your business and your logo in front of your clients and target audience for longer than any other promotional material. These magnets make great swag products for events or shows or for distributing to customers and friends. You can also design your own Save-The-Date magnets for your wedding guests, or create sentimental photo magnets for loved ones. Make your own monthly calendar or a stick-able list of emergency contacts. The possibilities are endless and the process is easy.